25 participants attended the full-day workshop including farmers, advisors, technicians and scientists. The workshop had three main parts: talks by practitioners, a field excursion and interactive working groups. 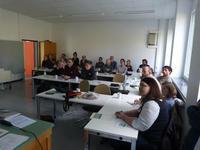 Three farmers and one advisor presented their rich practical experiences and knowledge about species mixtures, e.g. lentil - oat or lentil - false flax. During the field excursion workshop participants visited the research station of Kassel University (Neu Eichenberg) which is the central field of the German MAP. Here, a demonstration trial (winter wheat – winter pea) and several other experiments (e.g. 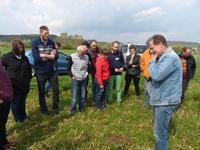 one experiment with clover undersowing) were presented and discussed.During the working groups three main questions were addressed: What mixtures are most interesting to test in practice and why? What main challenges arise during cultivation of mixtures and what could be possible solutions to these. A lack of practical experience, knowledge and education emerged as one barrier since mixtures require knowledge to coordinate the two crops (sowing time, sowing depth, time of ripening) and their interaction. Another perceived barrier was lack of subsidies for mixtures as ecological valuable areas (however an experienced workshop participant stated it is possible to get subsidies for mixtures).During the workshop several farmers showed strong interest in collaborating through on-farm trials (in addition to farmers already interested before the workshop). The potential of diversification through mixtures seemed to be a very interesting option for the farmers. Intercropping was suggested as a good means e.g. to make more efficient use of sun energy in wheat cultures. Therefore, it seems a first step to strengthen the use of mixtures in practice was achieved. The workshop participants generally gave a positive feedback with some suggestions for improvements (more time or less questions to work in in the working groups). The next steps will be to negotiate what mixtures will be tested on-farm. The first on-farm trials will start this autumn.